Apple has been expected to host a special media event on Wednesday, September 7th, and now it’s confirmed because invitations are arriving in the media’s in boxes. The company isn’t saying what it’ll announce, but the smart money is on new iPhones. Assuming Apple does unveil new iPhone models, pre-orders will most likely start on September 9th with delivery and in-store availability on September 16th. The new iPhone models, presumably the iPhone 7 and iPhone 7 Plus, are expected to look much like the iPhone 6s line they’ll replace. The new models are said to include faster A10 processors, improved cameras, more storage, and repositioned antenna lines. They won’t, however, include a headphone jack. Instead, the new models only will support audio over the Lightning connector and audio over Bluetooth. Apple’s media event is set to start at 10AM pacific time in San Francisco’s Bill Graham Civic Auditorium. Be sure to check in with The Mac Observer for our up to date coverage and analysis of the media event. 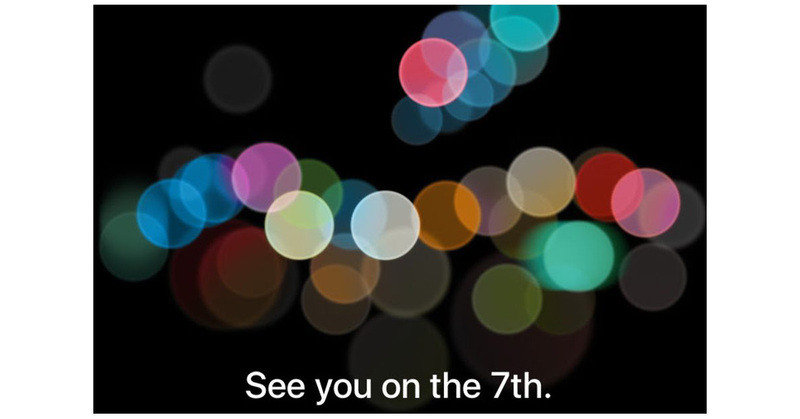 palmac, I’m guessing the out-of-focus dots are the top of the Apple logo. As for out-of-focus? Maybe a new camera focusing system?? ?